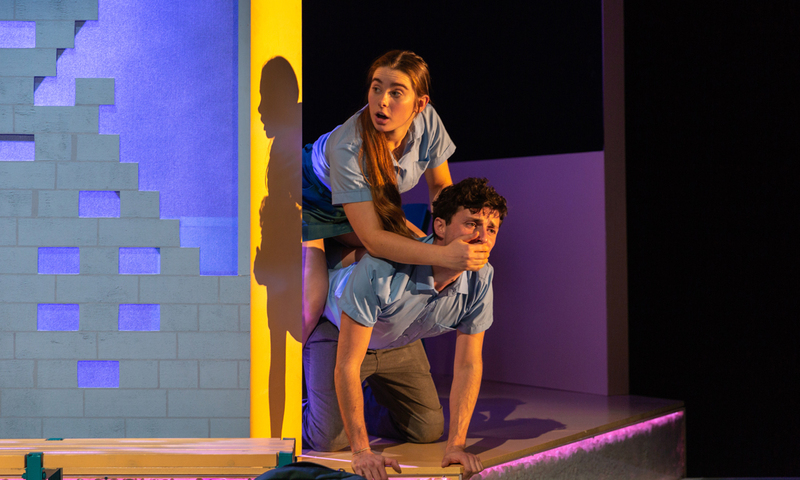 Written by Duncan Graham and directed by Sasha Zahra, this polished play highlights the similarities between children of different backgrounds, as well as the importance of communication and empathy. The two main characters – Hassan (sensitively played by Antony Makhlouf) and Chloe (Maiah Stewardson) – have been accused of stealing money while feeding the class axolotl and have been sent outside to work out who is responsible. As they talk, they forge an unlikely connection, building an understanding of each other’s backgrounds and motivations. They have at least one thing in common, which is that they have been forced by their parents to leave their respective homes and face life as the new kid at school. Hassan has fled Afghanistan as an unaccompanied minor and, through a series of flashbacks, we get to see his perilous journey. Stewardson has the mammoth task of playing not only Chloe but also Hassan’s interviewer, Katy Perry and several other roles – all of which she pulls of with grace and bravado. Although the subject matter is serious and meant as a conversation starter for high school students, it is also funny and the audience is thankful for the comic relief. Amphibian is an important new work that could help start difficult but important conversations about the global refugee crisis, detention on Manus and Nauru and Australia’s appalling record of ignoring its international human rights obligations. Amphibian is playing at the Space Theatre, Adelaide Festival Centre, until September 15.